In the clearing, the group is struggling to gun down the army of flame-men, but they’re running out of ammo. Suddenly, flame-men reinforcements arrive via river, riding giant leaves. After sinking a few, the Mysterymen and the Turtles realize that water can extinguish the flame-men. After cannibalizing the fuel pump from the Flying Wing, they hose down the flame-men and send them into retreat. 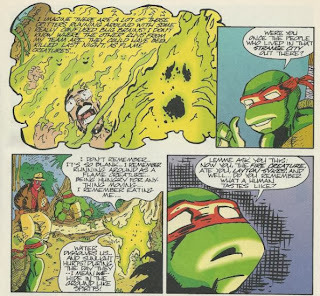 In the aftermath, all that’s left of the extinguished flame-men is protoplasmic goop which the Professor describes as being like giant amoebas (and which the Zeke's describes as smelling like Corn Flakes). The Shoveler and Star Shark, who were attacked by the flame-men, say that they weren’t burned but instead drained of energy, like they were being absorbed. Screwball panics when he can’t find his pet shoelace Sherman, but it turns up in a bag of Fritos. In the morning, Mystic Hand, Bondoman and the Spleen decide to stay behind and try to reassemble the Flying Wing while the others return to the I-Team camp and search for more clues. Shortly after they leave, the Spleen sees something lurking in the woods and Mystic Hand goes to investigate. Fiddling with the I-Team’s radio, the Professor determines that the electromagnetic static that brought down the Flying Wing is spreading out from the ruins and may soon envelope the whole world. They also find Polaroids of the I-Team getting along with the flame-men and keeping them as pets. Flaming Carrot presumes that once the I-Team ran out of things to feed them, the flame-men turned on them. The group decides to head to the ancient ruins, leaving Screwball, Leo and Don behind to guard the camp. Searching the tents, they find one of the flame-men sleeping on a cot. At the ruins, Mikey recalls the dream he had about the ancient city and follows his memories to a hidden opening in one of the buildings. 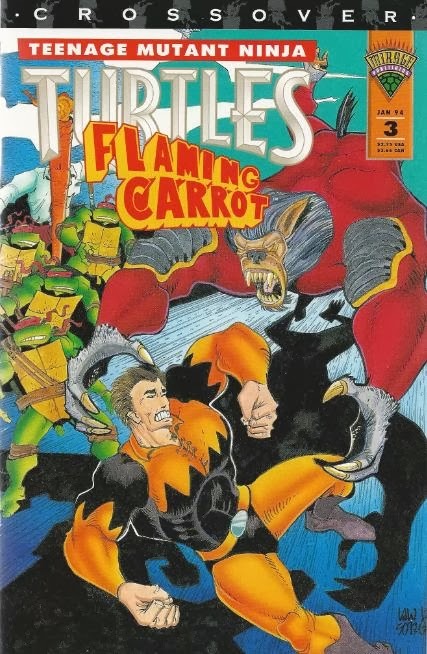 At last inside the previously impenetrable buildings, Col. Blade orders Star Shark to stay and guard the door while they split into groups: He, the Professor, Raph and Mike will go in one direction while Flaming Carrot, Mr. Furious, the Zeke’s and the Shoveler go in the other. Col. Blade’s group stumbles upon paydirt quickly, finding skeletons of strange creatures, albeit ones with gold fillings that imply a greater intelligence. At the camp, the flame-man introduces himself as P.F.C. Layton Sykes of Anniston, Alabama. He says that he was once a member of the previous investigation into the ancient ruins. His team encountered the flame-men, who ate anything but plants. When they ran out of food to feed them, the flame-men devoured him and his men. They were absorbed into the flame-men who ate them, merging their consciousnesses. Don asks if he remembers eating himself and, if so, then what do humans taste like? Sykes says “like chicken”. Back at the ruins, Col. Blade’s team finds a chamber with a hole blasted into it by a flamethrower (indicating the I-Team had been there). Inside are hundreds of glowing eggs, each containing a flame-creature. The Professor joyously announces that they must certainly be looking at beings from another planet. And at the Flying Wing, Mystic Hand returns with news that he found nothing. Suddenly, a trio of cloaked, spectral figures comes floating their way. And back again at the ruins, Flaming Carrot’s team finds a huge pod with a glass lid. Inside is what looks like a 9 foot-tall werewolf clad in a jumpsuit and boots. Ignoring their better judgment, they open the pod and release the werewolf. The monster chucks Flaming Carrot, the Zeke’s and the Shoveler out a window and into the sea. Tearing a pipe off the wall, Mr. Furious charges the werewolf. 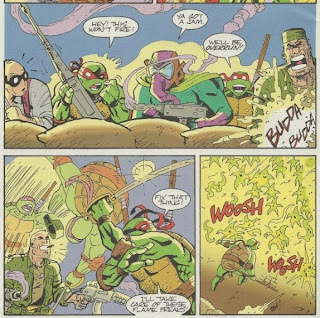 *This story is continued from TMNT/Flaming Carrot Crossover #2. The story concludes in TMNT/Flaming Carrot Crossover #4. As I said last time, Neil Vokes’s pencils really do improve this miniseries and it’s at least not as much of a grind to get through as before. He tries to put a lot of fluid motion and energy into his pages, even when the characters aren’t doing anything, and he succeeds in providing the characters with personality when the writing all but refuses to do so. Vokes has a nice cartoony, squash-and-stretch style that lends to some manic expressions that befit the absurd goings on. He’s a much better fit for the material than Lawson was, I’ll say again. 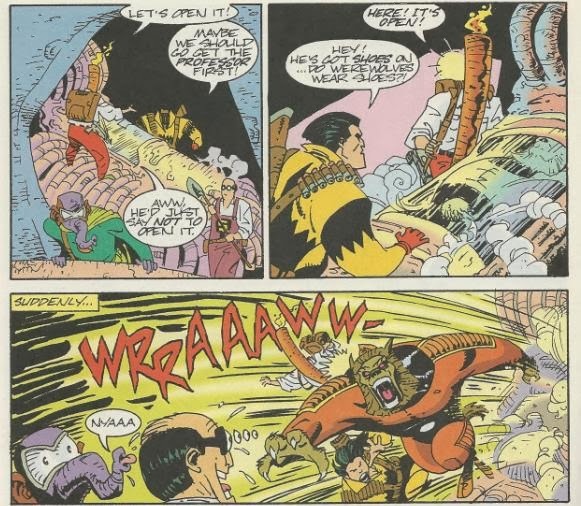 But aside from the art, it’s hard to believe a story about superheroes and mutants battling flame-monsters in a ruined city could be this boring. A lot of it has to do with the excessive dialogue and narrative text that Burden, er, burdens the pages with. Characters have to think about or announce what they’re doing and narration has to describe what we’re looking at as if we were blind. I guess it’s supposed to be this faux Silver Age gimmick or something, but it slows everything down. 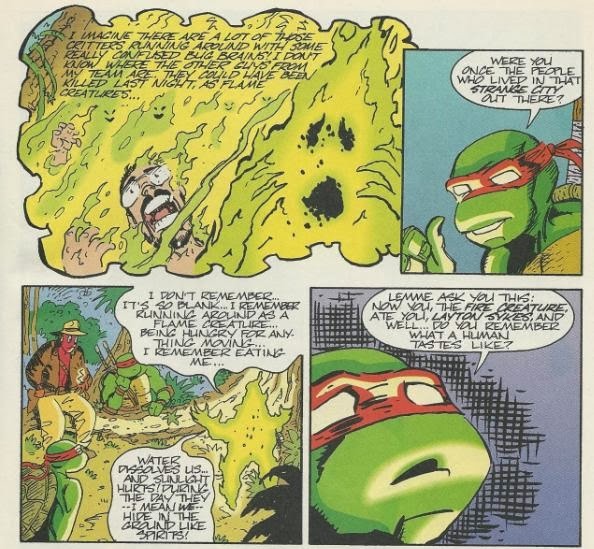 As do all the pointless, random jokes like Screwball’s pet shoelace, the Zeke’s smelling Corn Flakes in the protoplasmic goop and Donatello setting up a tired “tastes like chicken” gag. And did I mention that it takes the characters 8 pages to realize “water puts out fire”? Because seriously. So when I said earlier that this second half of the miniseries is less of a grind to get through, that doesn’t mean it still ISN’T a grind to get through. Because it is. Well... it's an old comic... maybe the 'tastes like chicken' gag wasn't as played out back then. Wasn't the chicken gag used during the old Bugs Bunny cartoons from the 40's and 50's? Pretty sure it was dated by the 80's and especially the 90's.